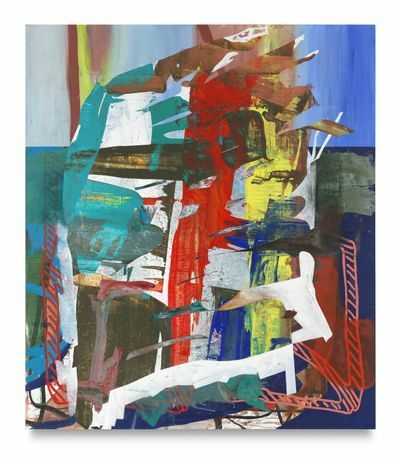 Sikkema Jenkins & Co. is proud to present Paintings, an exhibition of new work by Arturo Herrera. Over the past 18 years, Herrera has developed a diverse body of work (most prominently collage, felt sculpture, and wall painting) that references the complex legacy of abstraction using modernist strategies of fragmentation, re-composition, and repetition, often employing found material and/or imagery from popular culture. For the current exhibition, Herrera applies these strategies to the painted canvas for the first time, free of the collage elements that were incorporated into several recent series. Combining and juxtaposing abstract sources, the paintings suggest a defined disorder - a restlessness filled with associative meanings. While a novel medium for Herrera, the paintings use a vocabulary that is familiar to the artist, from the abstract gestures present in his work since the 1990s to the complex layers of shapes, colors, and texture reminiscent of his well-known collage work. The paintings can be seen not so much as a departure, but an evolution in Herrera’s body of work.